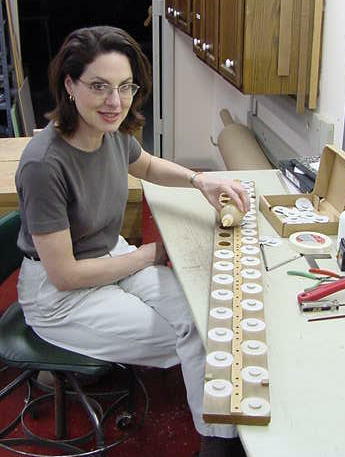 Columbia Organ Leathers offers complete releathering services for Pipe Organs by all manufacturers. From a few pouches or book pneumatics to an entire instrument including reservoirs, we have the facilities to complete your project in a short time at an attractive price. As a subsidiary of Columbia Organ Works, Inc., Columbia Organ Leathers has at our disposal all of the facilities of our parent company. A fully equipped, 25,000 square foot workshop with complete woodworking facilities helps insure our ability to complete your project in a timely, professional manner. If desired, we can even travel to your job site, remove the components, releather them in our facility and return, install and adjust them for you. From a straight forward releathering project, to one which requires the replication of missing or damaged parts, we are an excellent source for sub-contracting your releathering needs. (Note: This form is for use by organ builders and technicians or those planning to do their own removal, shipping and re-installation of completed organ components. If you are requesting a quote for more extensive services (such as complete organ restoration or other onsite repairs) we can better accommodate you from our Columbia Organ Works Website.